Elizabeth from Simple Simon & Co. shows how she created this patchwork baby bib. She uses a quilt-as-you-go technique. The small pieces of fabric make this a good project for using up scraps. She used a free baby bib pattern from Craft Passion. If you have a favorite bib pattern already, you could just as easily use it, too. They’re quick and fun to make. You could sew up a stack to have a stash of baby shower gifts. 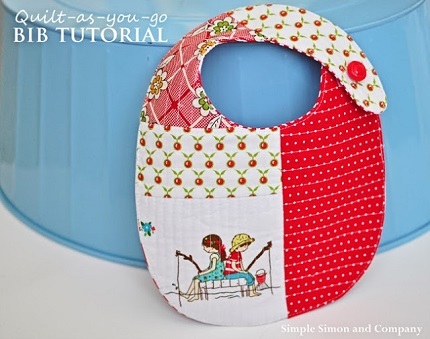 Go to Simple Simon & Co. to see how she created a quilted patchwork baby bib.